Norwich City suffered a third straight Premier League defeat as Salomon Rondon's header secured victory for West Bromwich Albion at Carrow Road. Canaries forward Nathan Redmond forced a fine save from keeper Boaz Myhill before firing wastefully over. Craig Dawson spurned a great chance for West Brom when he headed over unmarked before Rondon's winner. The £12m buy from Zenit St Petersburg powered James McClean's cross beyond John Ruddy from close range. Norwich had their chances but remain 16th in the Premier League table after a lacklustre performance on the back of a 6-2 defeat at Newcastle last week. In contrast, West Brom leap five places to eighth spot after another excellent defensive display. Since blowing a 2-0 lead to lose 3-2 at home to Everton on 28 September, the Baggies have had two clean sheet wins in three league games. West Brom created plenty of chances before club record signing Rondon scored his second goal since joining the club in August. It was an impressive move that led to the winner, but West Brom's dogged and determined defending was key to their fourth win of the season. Dawson, despite his glaring miss at the other end, was impressive along with Jonny Evans and Gareth McAuley when Norwich were at their most dangerous. Manager Alex Neil could have done without this result going into a tough run of fixtures. Three of Norwich's next four games include matches at Manchester City and Chelsea along with a trip to Arsenal. The Canaries started the season brightly with just two defeats from seven games, but things are starting to unravel. Against West Brom, Matt Jarvis on the left wing proved a dangerous outlet but Norwich lacked bite in front of goal. Redmond missed two great chances when the game was goalless, and there was little response from the hosts after falling behind. Norwich City manager Alex Neil: "I wouldn't say it is worrying times. It is not a nice time, I have never even lost two league games in a row, never mind three. "Yes, you are concerned, I'm looking at what I can do to put it right. I'm trying to do everything I can and I'm working as hard as I can and it is about making sure when the lads are on the pitch they do as well as they can. "In our box we didn't defend well enough and in the other box they defended it well." West Brom manager Tony Pulis: "The defenders do a lot of work on the training ground, we work very hard on certain aspects. "We talk about it because of the record I have got but we also work hard going forward and today we got our reward. The quality of our play going forward was very, very good at times. "We also thought we should have had a penalty and we had a couple of headers as well." Norwich have an opportunity to forget their poor league form on Tuesday when they visit Everton in the fourth round of the League Cup. They desperately require a confidence-boosting win before their next league match at title-chasing Manchester City on 31 October. As for West Brom, they entertain in-form Leicester next Saturday before a tough double-header away to Manchester United on 7 November and at home to Arsenal on 21 November. Match ends, Norwich City 0, West Bromwich Albion 1. Second Half ends, Norwich City 0, West Bromwich Albion 1. Attempt missed. Dieumerci Mbokani (Norwich City) header from the centre of the box misses to the left. Assisted by Russell Martin with a cross. Foul by Robbie Brady (Norwich City). Stéphane Sessegnon (West Bromwich Albion) wins a free kick in the defensive half. Corner, Norwich City. Conceded by Craig Dawson. Substitution, West Bromwich Albion. Craig Gardner replaces Saido Berahino. Attempt saved. Alexander Tettey (Norwich City) right footed shot from outside the box is saved in the centre of the goal. Assisted by Robbie Brady. Attempt blocked. Nathan Redmond (Norwich City) right footed shot from outside the box is blocked. Attempt missed. 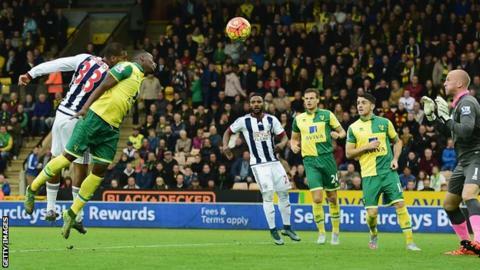 Sebastien Bassong (Norwich City) header from very close range misses to the left. Assisted by Nathan Redmond with a cross following a corner. Corner, Norwich City. Conceded by Gareth McAuley. Attempt missed. Ryan Bennett (Norwich City) header from the centre of the box misses to the right. Assisted by Matthew Jarvis with a cross following a corner. Corner, Norwich City. Conceded by Boaz Myhill. Substitution, Norwich City. Cameron Jerome replaces Wes Hoolahan. James McClean (West Bromwich Albion) is shown the yellow card for a bad foul. Alexander Tettey (Norwich City) wins a free kick on the right wing. Foul by James McClean (West Bromwich Albion). Foul by Ryan Bennett (Norwich City). Rickie Lambert (West Bromwich Albion) wins a free kick on the left wing. Substitution, West Bromwich Albion. Rickie Lambert replaces Salomón Rondón. Attempt missed. Russell Martin (Norwich City) right footed shot from outside the box is high and wide to the left. Assisted by Dieumerci Mbokani. Wes Hoolahan (Norwich City) wins a free kick on the right wing. Offside, Norwich City. Matthew Jarvis tries a through ball, but Sebastien Bassong is caught offside. Alexander Tettey (Norwich City) wins a free kick in the attacking half. Dieumerci Mbokani (Norwich City) wins a free kick on the left wing. Foul by Stéphane Sessegnon (West Bromwich Albion). Corner, West Bromwich Albion. Conceded by John Ruddy. Attempt saved. Chris Brunt (West Bromwich Albion) right footed shot from outside the box is saved in the top right corner. Offside, Norwich City. Sebastien Bassong tries a through ball, but Dieumerci Mbokani is caught offside. Attempt missed. Russell Martin (Norwich City) right footed shot from outside the box misses to the left. Corner, Norwich City. Conceded by Chris Brunt. Nathan Redmond (Norwich City) wins a free kick in the attacking half.